The movie then jumps to our future, where a group of scientists have arrived at a planet indicated by hieroglyphics found in multiple places on Earth, a star pattern that no human could have seen without the aid of modern telescopes. The hieroglyphs indicate giant beings pointing to the star patterns, which is naturally translated by our scientists as a suggestion to go there. So they went, bringing along a decidedly amoral (or maybe non-moral is a better term) robot, an executive of the corporation that financed the mission, and a video from the corporation’s CEO, now years-dead, advising them to follow the orders of the two scientists who convinced him to finance the mission. It is mentioned here that Prometheus, coincidentally the name of the ship, was a god who wanted humans and the other gods to stand as equals, and so he was cast out of heaven. It is presumed by a clever audience that this little tidbit will somehow relate to the story about to unfold; and it does, but not in the way the audience might expect. When the crew lands on the planet found closest to the star pattern, they naturally explore a nearby buried structure, and in moments the first sign of scientific stupidity is presented to us: The scientists decide the air is safe, and remove their helmets. What made them think the air was going to stay that way? That kind of lack of forethought doesn’t make for good scientists. We are also shown the presence of worms in the ground, so we know this area can support life. Soon we are presented with hauntingly-familiar images to anyone who’s seen the original Alien. Rooms full of vases are very similar to the floor full of alien eggs encountered in the first movie… and as soon as people arrive, they begin to “sweat” and leak black fluid everywhere. Amazingly, crew members actually have to be advised to not touch things, and leave things alone; what kind of scientist has to be told not to contaminate a sample or corrupt a study site? Have “scientists” become complete morons in the future? Or maybe just the ones who work for money? Perhaps this tired trope serves us by forcing us to examine its clear foolishness, in order to reconsider the foolish things we often do in the name of science… or in complete ignorance of it. Soon, a severed fossil of a head is found… but it turns out to be a fossil-looking helmet concealing the still-intact head of an Engineer. And the head is intact, not dessicated, despite the fact that the helmet was severed from the suit, not hermetically sealed, in an atmosphere that we have seen can support life, for a few thousand years. Could these beings be that resilient… even after death? More importantly, the find allows Shaw to determine that their DNA and ours is the same, suggesting that we are products of the Engineers. Or maybe we and the Engineers are products of something else. Are the humans looking at their creators… or another creation? If another created the Engineers and us, that would make the Engineers our brothers. And if the Engineers are our brothers, could it be possible that they have similar questions of their creators? We start to get interesting questions posited to us by the crewmembers now: The robot, David, asks Holloway why he was created, and when the answer is given—”because we could”—David asks how a human would feel if his Creator gave him that answer? And almost immediately, demonstrates his amoral nature by purposely slipping some of the bacteria from a vase into Hollaway’s drink. Did he do it because of Holloway’s answer to him… or did he already consider Holloway expendable, as David himself must have known he was considered? And Holloway’s lover, Shaw, confronts the captain, who now confesses that the one thing he cares about is protecting mankind. He believes that the things they’ve found are a result of alien experimentation on an outpost planet, like a remote weapons testing installation, because they were too smart to carry on those experiments at home… and that they’ve clearly gone wrong. It sounds likely… but why? What is the purpose of hyper-accelerating DNA? Or is there a purpose at all? Was Holloway’s comment about the robot—”because we could”—a reflection of the humanoid’s feelings toward their experiments? Or was there an agenda? Things naturally go downhill from there, in true horror-movie fashion: Two other crewmen who were stranded in the alien caves (when they got lost during evacuation, and no one noticed until the ship was sealed) come across snake-looking lifeforms with what seem to be suckers for heads. Again, the scientists demonstrate incredible amounts of stupidity by moving close to them, acting as if they’ve just found kittens in the grass… and are killed in minutes. These snake-like things showed up after the vases began leaking onto the ground, where we know there were worms; did the fluid from the vases cause the worms to mutate rapidly into something new? Or were these creatures in the fluid already, and grew on their own once released? And is this somehow connected to the rapid growth and development we’ve seen in previous Alien movies? And soon, we find out that whatever Holloway ingested is killing him, and he begs to be killed before it gets out of hand. Somehow, though, he didn’t think tiny worms borrowing out of his eyes were important enough to mention to the woman he’d just slept with, Shaw. And when those who came in contact with him are examined for contamination, we discover that Shaw—who was supposedly sterile—is now pregnant and pretty far along, causing her to self-administer a caesarian section to get whatever it is out of her. What we see looks like a terrestrial squid, with the addition of one of those mouth-tubes that Alien made so famous. Since we really don’t know what was in that fluid originally, we don’t know if it contained bacteria that eventually grew into this creature… or if it spurred the growth of something already inside Holloway and Shaw. And because it looks pretty much like a squid, it begs the question: Do humans have that potential creature hidden away in their DNA, or was it given to them? And, of course, it suggests that there is supposed to be a connection between the squids on our world and this alien; remember the humanoid at the beginning, who died at the waterfall as his DNA rewrote itself? Did that new DNA from the humanoid create the progenitors of squids? David later stumbles upon a recording that convinces him the humanoids were going to bring these incredibly dangerous DNA accelerants to Earth; whereupon he returns to the ship and gathers his creator, the close-to-death Mr. Weyland, who secretly accompanied them in stasis hoping to find the fountain of youth (naturally). Not surprisingly at this point, they discover that one of the Engineers is alive in his own stasis chamber, and they wake him so David can ask the Engineer to help Weyland. The Engineer proceeds to surprise everyone by going on a killing spree, wiping out all of the crewmembers present. Why would a member of a supposedly intelligent, superior race kill his visitors? Consider this: Could that Engineer have been left behind as a fail-safe for the experiment? Was he, in fact, a soldier tasked with protecting the installation, and therefore attacking the aliens (to him) who had shown up in his ship asking stupid questions? Or maybe, like another crewmember who’d been exposed to the snake-like worm and later went berserk, the Engineer was not in his right mind for similar reasons? Something else to consider: If the Engineers were, like humans, created by another race… maybe they fear humans will turn out to be the superior beings in time, and are doing all of this to eradicate the competition. The captain’s suggestion that the planet is full of biological warfare materiel may be dead-on. Finally, the Engineer climbs into the pilot’s chair and starts to take off… as David and Shaw believe, presumably to Earth. Do we have anything concrete to show he’s going to Earth? No; we do know that Earth has presumably been experimented on before. In fact, he could be going anywhere, including back to his homeworld to report the disaster; to some other world in order to carry on more experiments (or just dump the cargo on them); or even back to his homeworld to dump the experiments on them. Or maybe, as David alluded to earlier on when he suggested that the goal of every child is to bury his parents… maybe the Engineers are planning all of this to attack their creators, not us. If he’s a good soldier, he may be trying to complete his mission… if he’s a scientist, he wants to complete his experiments (and yes, both of these options could lead to Earth)… if he’s a pilot, he may just want to get home and get paid… or punish those who left him in that situation. There is really no way to know for sure. Either way, Shaw decides the Engineer must be stopped, and here’s where the Prometheus parable comes in: Shaw advises Prometheus to stop the Engineer ship, thereby preventing the Engineers from unleashing the monsters on Earth, which leaves humans able to someday attain a level even with the Engineers… to sit with the gods. In so doing, Prometheus is destroyed—thrown out of heaven. Shaw seems to be stranded, but as it turns out, David was not destroyed by the Engineer, and entices Shaw to fetch him so they can fly another Engineer ship home. She agrees, but not to go to Earth: She wants to go to the Engineer’s planet. She wants the answers to what we want to know as well: Did the Engineers create man, and why? Were we no better than lab rats to them? Did they intend to eradicate us, or was the materiel found on the planet just intended to be another experiment to see what would happen? And as we hope she will find an answer, we too are hoping to see a sequel to this movie, so we might know the answers as well. Most insidiously, looking back throughout the Alien franchise, and at Prometheus, we have to consider the inherent suggestion that the alien is, essentially, not a new species, but created by our bodies when exposed to this DNA-accelerating fluid or bacteria; the aliens are our progeny, our future, our children trying to bury us. We’ve been brought in a vicious circle. 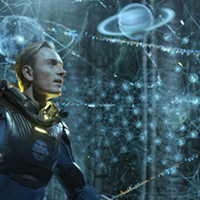 Prometheus was an excellent science fiction production, though the story proved to be transparently manipulative in typical horror-fashion, much like the original Alien was. However, the real value of this movie comes from the moral, philosophical and metaphysical questions it poses to the audience, to consider our origins, our place in the world, our responsibility for our actions, and our consideration of other beings. Best of all, it does not impose its own answers upon us, but leaves us to answer them for ourselves. Such debates could not only inspire further thought in our everyday lives, but it could spur a resurgence of interest in “intelligent” science fiction, stories and movies designed to make audiences think as much as (or more than) react to monsters, explosions and stupid scientists. This kind of movie inspires cult-like followings, those dedicated to unraveling its every secret (and positing a few of their own, just as I have above). Prometheus could be the jumping-off point for a new chapter of science fiction, a return to the overriding question of “Why?” that SF has let slide for far too long, and which it has always been at its best when trying to answer. I’d say science fiction is long overdue for the influence of the cult of Prometheus. Next Next post: Does anybody care? Actually we do know it was going to Earth. In the final shot of the space jockey in the chair, the holographic display traces a green line to a small representation of Earth – you can just see the continent of Africa as it rotates out of shot. Ah, I obviously missed that; must have been distracted by something else in the shot. I suspect that there’s a great deal to Prometheus that reveals itself in multiple watchings.